I thought I’d share some things I learned this weekend. As everyone knows by now, I’m HEAVILY into Great Danes and Great Dane rescue. I’m on the board of and am the vet coordinator for the Rocky Mt. 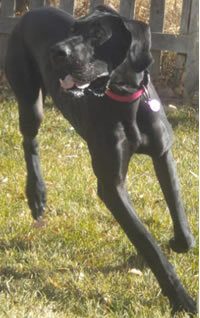 Great Dane Rescue, which covers about eight states, last I checked. This has been one of the most rewarding and educational experiences of my life. So, this is Peyton. Isn’t she adorable? She’s only one years old and is playful, sweet and loves her people. But, she also has Struvite Crystals, which are formed in the bladder because her urine is too alkaline. Crystals can become stones and as I’m sure some of you know, that is VERY painful. So to keep that from happening, I’ve had to research and come up with a special diet for her which will hopefully make her urine more acidic, not creating any more crystals. We discovered this because one of the reasons Peyton was turned into rescue was her inappropriate urination, which basically means she peed in her kennel at night or in the house, even though she was housebroken. We decided to see if there was a medical reason for this and lo and behold… One of our awesome rescue partner vets discovered this and now Peyton is well on her way to having her problem cleared up and will hopefully never have to know the pain of bladder stones. Other things which could point to bladder crystals or stones are UTI (Urinary Tract Infections), bloody urine or straining to urinate. Peyton had not shown any of those symptoms so we’re hoping we caught it early. Later this week, we’re doing an ultrasound on Peyton to make sure the crystals haven’t formed stones yet, and we’ve already checked to make sure she does not have any kind of infection. These procedures are based on our vet’s recommendations. The only advice of our vet I don’t plan to take is to put Peyton on a “prescription” commercial dog food diet. Right now there are two options that are most widely used and I’m not going to name them or go into details of why I’ve chosen not to use them, but suffice to say 1) they are expensive as all get out and 2) I don’t feel they provide a good balanced diet to a dog of Peyton’s size. Instead, I’ve been researching and reading about special diets for bladder crystals and stones and what kinds of food are acidic vs. alkaline. The general consensus is that chicken, beef and fish are the best proteins for a dog with this issue. Rice (brown preferred, but white will do), beans, cottage cheese and yogurt balance out the meal. Based on some canine nutrition books I have, I provided Peyton’s foster home with both a raw food and a home cooked food recipe and that’s how we’re proceeding. I’ve recently discovered this homeopathic remedy for bladder health that I’m also going to look into and possibly try with her. It won’t hurt and can only make our job easier for us and Peyton. I guess the point here is that it is up to each of us who plays guardian to our pets to educate ourselves and understand the full scope of any issues our pets may have. A good veterinarian is a vital part of this. But don’t stop there. The internet and the library are full of information that even not all vets know about. I just like to know my options and make my own educated decisions.